You know those days when you’ve hadituptohere at work and you’re worn out and the last thing you want to do is make dinner? Like you would rather eat bad takeout pizza instead of chopping and mincing and cooking? We’ve been there, too. More times than we’d like to admit :). When we get like that, though, and we know cooking will be healthier and save some money, we always do one thing and it always makes it such a more enjoyable experience for us. We put on some music! But not just any music, because it has to be just right. The secret to making cooking more fun is all in the type of music you play. For us, we get inspired and in the mood with “French Cafe Radio” on Pandora. Have you ever listened to that station? It takes you to another place and time and you feel like you’re in Paris cooking at a fancy, upscale restaurant. 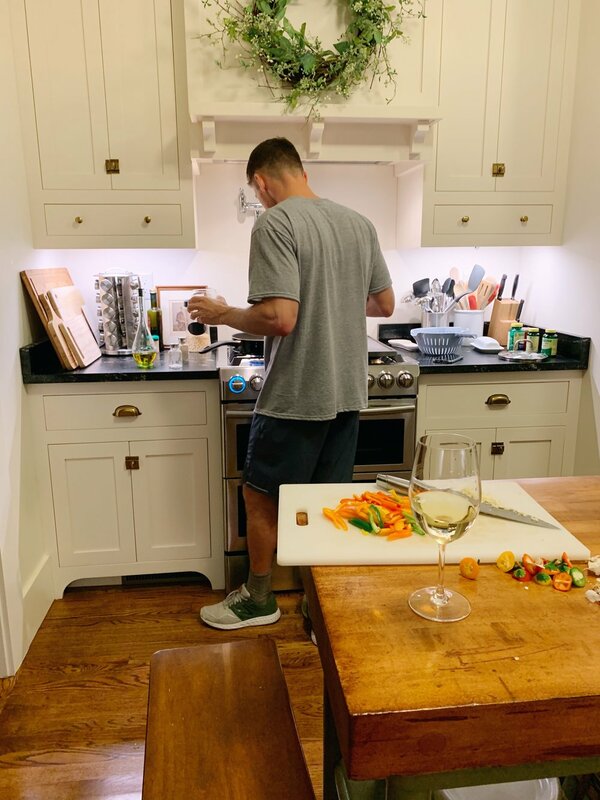 Or maybe you’re in a movie, a romantic comedy, if you will, directed by Nora Ephron (RIP) or Nancy Meyers, and it’s the cooking montage scene where they making cooking actually look fun. Of course, it always helps make it more fun when we cook together, but even on those nights where one of us is busy so the other one is left to cook dinner alone, this music reminds us to have a little fun and to not think of cooking as a chore or something we have to do, but as something we look forward to doing, something to have a little fun with. Even if you’re just making grilled cheese! Pour a glass of wine, turn on some French Cafe music, and have a fun night in with just you and your kitchen. You never know! It could turn into something you look forward to every night ;).